I did not come here to be part of a pack of murderers. (SPOILERS) In which Keifer offers us Middle-Aged Guns. The main selling point of Forsaken is Sutherland Jr playing against his dad, but even this, as welcome as it is in part, is undercut by 24 veteran Jon Cassar’s TV direction. It’s only when events culminate in the much-awaited shootout that he really seems to be in his element, the movie playing as Unforgiven-lite from the title down. There’s another 24 problem with Forsaken; after seven seasons (I bowed out at that point), every Keifer tic and tilt and nodding head movement is ingrained – Martin Freeman’s another actor guilty of such irksomely involuntary gestures – and it very quickly becomes a little annoying to see in John Henry Clayton. Brad Mirman (Body of Evidence) fashions a screenplay that hits every dutiful traditional trope (or cliché); hero with a painfully guilty past (all that killing in war changed him, he blames himself over his brother’s death), persevering under duress, getting beaten and taking it, only picking up arms when his nearest and dearest is laid low. There’s even a long-lost love (Demi Moore). Cassar clearly isn’t used to this kind of pace, and he isn’t adept at concealing its over-familiar elements or making them work to the picture’s favour. On several occasions, John Henry is stirred to reproach the bad guys, only to back down and turn the other cheek when they ask him what he’s going to do about it. As it plays, it looks less like he thinks twice after being unable to restrain his righteous indignation and more like he’s just really stupid. 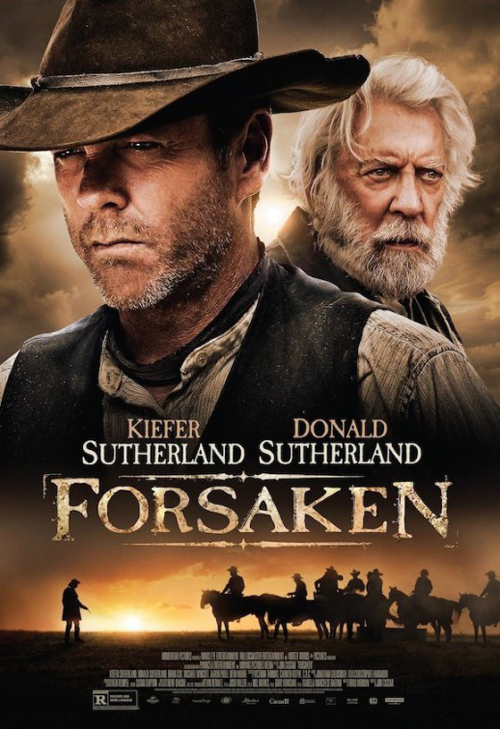 The main reason to catch Forsaken is Wincott. The picture picks up every time he’s on screen (“Did you ever kill anyone, or did you just talk them to death?” inquires a hired gun, seconds before finding out). There are several strong scenes between Wincott and Keifer that work better than the more emotive ones between the latter and his dad, including reminiscing war time experiences (“I was on the other side of Owl Creek”) and their inevitable confrontation (“No one hires a gunman to run from trouble”), resolved highly satisfactorily when John Henry releases Gentleman Dave from his contract. It’s Gentleman Dave who delivers the voiceover highlighting William Munny’s John Henry’s last known whereabouts. Which is fine. I don’t want a sequel about John Henry Clayton (although I wouldn’t mind Young Guns III). I want to see Gentleman Dave Turner: The Movie.